Low profile ﾓMixed-flowﾔ fans with soundabsorbent insulation. Extremely quiet. Manufactured in plastic material, with a specifically designed internal skin to direct the sound waves at the right angle for them to be captured by the sound-absorbent material (1). Fitted with rubber gaskets on the inlet and outlet to absorb vibrations, a body that can be dismantled. Connection box can be rotated 360ﾺ, to facilitate easy connection of the power cable. Speed controlable 230V-50Hz motor, of two speed motors. IP44. TD-SILENT versions fitted with a run-on-timer adjustable within 1 and 30 minutes and onespeed motor not suitable for speed control. Aerodynamic inlet to improve airflow and reduce sound. 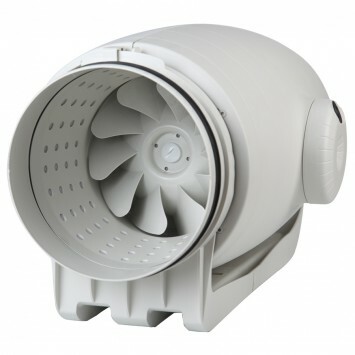 Detachable fan unit without demounting duct connections. IP44. External terminal box IP55. Removeable fan body with 2 speed motor, single phase 230V-50/60Hz speed controlable, Class F, external rotor aluminium motor with capacitor and thermal protection.